According to NJ.Com’s Mike Kaye the Philadelphia Eagles had a visit with Mile Sanders prior to his Pro Day. Penn State RB Miles Sanders visited with the #Eagles prior to his pro day. It's not an upcoming visit, per league source. The Eagles previously had a formal meeting with the Penn State prospect at the NFL Combine a couple months back. With the Eagles doing their homework on a ton of the backs in this draft, Sanders is a prospect that many fans have been excited about over the last couple of months. The former Mr. Pennsylvania was high school standout and a five-star recruit coming out of Woodland Hills High School. The 5-foot-10, 211-pound Sanders had to wait his turn to break out, after following in Saquan Barkley’s footsteps the last couple of years. 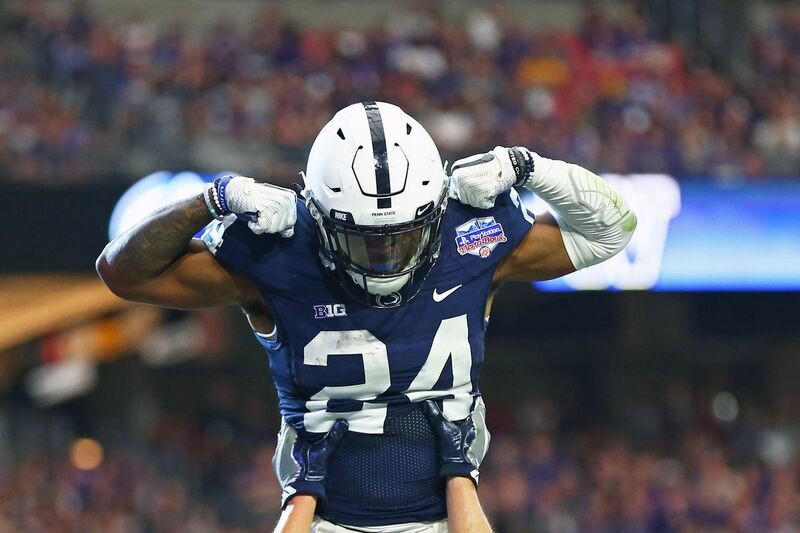 However, 2018 was good to Miles Sanders and his brand, as he finished second in the Big 12 in rushing, with 1,274 yards and 9 touchdowns, averaging 5.8 yards per carry. As a receiver out of the backfield, Sanders hauled in 24 passes for 139 yards as well. Moving forward, it’s easy to see why the Eagles are interested in Sanders as he worked out of a heavy RPO-heavy scheme. Sanders could be a three-down back at the next level showcasing a well-rounded skill set. At the combine, he tested well athletically and opened some eyes with his strong performance. One thing scouts would like to see from Sanders is better ball security, fumbling 9 times on 308 touches, which comes out to a fumble every 34.2 touches. Overall, looking at the Eagles backfield, Sanders could find a nice role in his rookie year and be groomed to take over the position in his second year. With the Eagles having two selections in the second round, that could be right around where he should come off the board.